Thanks guy's you have got me a lot of informations about "arming doublet". I think that I didn't speak clearly what I mean in the previous post, especially I was asking about using padded vest over the "arming doublet" (and under not full plate armor but lighter torso armour like chain mail, brigandine or breastplate) using by soldier with poleaxe, halebard etc. in german style from last quarter of 15th century. There is lots and lots of evidence for padded aketons and gambesons in text until 1450. Some major mid 15th century major sources on the French side of the 100 Years War indicate this from Le Fevre, Monstrelet and de Warrin. As for outside these areas we have the Venetian Senate rolls that require a thick doublet under plate for their heavy horse they are equipping in the 1460s. I have not spent much time looking at anything but urban inventories in Germany but since most if not all of Europe is doing this until at least mid 15th I see no reason why they would not to this point. After this point it does indeed get harder as the garment under the armour is often just called a garment, doublet or whatever though in several knightly inventories of France and England of the period (such a probate records) they have doublets listed in martial accounts, separate from other clothing (probate records typically go room by room so you can deduce something in the kitchen has to do with cooking and such). In on of the Howard letters it mentions a doublet being under the plate but little further description. As just to look at the logic. Just because we do not see the need to padding under the armour does not mean they did not and vice versa. Such uses of logic are circular so limited in employment. it's pointless to sew arming laces onto civillian clothes, but nevertheless people may have done it and do such things even today. Just have a look at camouflage-pants. They are pointless in modern civil society. True neither serves the functional role they emulate but fashion has its own function in every society. Fifteenth century Italians were mad to appear as a member of the military elite, even so far as to dress their children in civilian doublets that mimicked functional armour foundation garments. As for outside these areas we have the Venetian Senate rolls that require a thick doublet under plate for their heavy horse they are equipping in the 1460s. I would be very interested in reading this reference. It comes from 15th century (Luebeck). You should look up the Venetian Senate Rolls. It has loads of interesting information. If I had more time I'd be reading it but I am in the beginning of reading all the English Patent Rolls again. The account is rather straight forward it simply states the men at arms should be equipped with certain items. Really "padded", or do you mean textile armour? Like the ones from lubeck and stendal mentioned several times, and dating to the early 15th century? We also have pictures for such in that time frame, even for later versions, but those were worn without backplate, or half backplate, and such configurations. What is the exact description, and what tells us about those garments? I mean, we also have descriptions of special garments worn in tournaments, so really all surrounding information is need to judge what it meant. In several texts the word "aketon", "jupon", "gambeson" and "doublet" was used interchangingly, and we know that in that time frame civilian doublets were filled with cotton wool and quilted. So the question is if they wore really special textile armour or simply quilted garments. You don't need a quilted garment underneath plate armour. Also not in the early 15th century. Also not in the late 14th. A textile armour component makes sense if you have mainly maille, perhaps with several plate additions, but it does not make too much sense with a body fully covered in plate. Which is not the same as "wearing plate armour". As said, there are images showing people wearing lubeck/stendal type of textile armour (which has no sleeves!) in combination with maille and a breast plate (with no faulds) and in one occurance, a small backplate. If they called such "aketon" too, then we have this combination. Don't get me wrong, I do not doubt that people tend to use the same garment, especially doublet, often or even whenever they wore their plate armour. But the question is, if this garment had distinct features. That's the same as "only if you don't know it it doesn't mean it wasn't there! Yes, of course, but without sources it is mere speculation. And obviously there are lots of evidences which do show normal clothing worn underneath armour. So it seems people in the late 15th century also did not need "padding" in all cases. So the question is: why do reenactors tend to search for it at all costs? Now on doublets I will give you that they are ambiguous, even jacks though most ones in accounts I can think of with details of construction are indeed padded, but aketons and gambesons never to my knowledge were unpadded and unless there is evidence to the contrary I think there is no reason to assume they were anything but padded textile armours even when used with full harness at least till mid 15th. For the most part I avoid using anything but battlefield equipment as there are too many questions on overlap with joust and war in the late medieval period. Several period accounts are clear they were used together and those including construction details seem fairly clear as well to being padded. The only conclusion seems to be they still were worn together with increasingly full plate harnesses? Now I do not think any one here is saying they are as heavily padded as stand alone textile armours or the earliest ones simply used under mail (at least I am not) but there likely is a transition. We seem to get hints of this in several accounts like Edward's inventory which included a aketon for plate which was less padded. There very likely is a period of transition from the heavier ones of the c.1300-1350 on to lighter ones with little and then perhaps no padding but once again the only evidence we have of unpadded ones is the Hastings MS from the last quarter of the 15th. A lot can happen over 25, 50 or even 100 years. A danger here is using our own modern sense and reasoning as medieval. It is not medieval in context nor do we sufficiently have to face the same variables. We are not fighting to the death in this stuff (at least I hope not), our lives for the most part do not hang on the balance. For this reason to my mind we should not over rule the evidence we have with what we think of as simply sensible to our modern and out of context selves. We should look at the evidence and try to conform our understanding of this topic and fill in the gaps as needed. Years ago I took some philosophy classes where our lecturer usually ended with what seemed to be rhetorical logical phrases and to this day I can say many still make little sense. But that may be because I am a historian and not a philosopher. 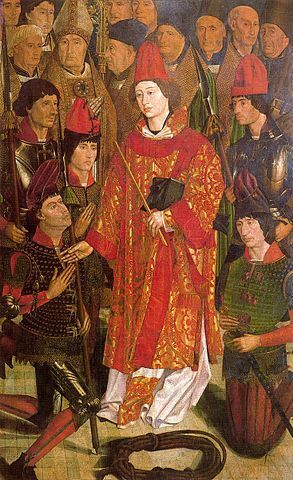 Here's one that I don't think has been posted here yet - St. Vincent, by Nuno Gonçalves (1465). I'll post two versions - one shows the arming doublet a little better (one of the examples we have that clearly shows points, on the right arm), while the whole image is one of the rare examples I've seen of hosen with what appear to be reinforcing 'straps', possibly also used for pointing armour. I just found this thread and am very impressed. Stefan I think your doublet is exactly what I'm looking for. I'm just starting a project around the battle of Flodden 1513. Although it has been simmering for a year or so I hope that in the next couple of weeks I will get the go ahead. I've already had quotes for my armour and some of my clothing is already made. However I had come to a dead end when I came to my arming doublet. I already have two jacks. The first is very padded/filled and I use this with jack chains, voiders and a breast plate. I also wear upper leg protection hung from my pourpoint. The second one is less padded and a better/tighter fit. I had this made to wear under the brigadine I'm having made. Both in my opinion are not close enough fitting to wear under full upper armour (early 16th century type). I also don't think heavy padding/filling can be correct looking at the images here and the ones I've found else where. I know the paintings etc are an artists impression but unless the people depicted were stick insects the shape shown only works with well with fitted garments rather than ones with heavy padding. The exception is where padding is shown such as on upper arms/shoulders where there is no armour. If any ones knows of any existing arming doublets/images from around 1513 I would be very gratefull. Addressing the whole idealised body shape thing. Hose still in progress, doublet badly laced (crosslaced instead of ladder or spiral, so ended up not laced fully, and gathering up the front a bit), forearms not laced at all, made from cotton to keep expenses down. Unpadded, but more than enough for wearing a BP, getting hit with heavy blows stings a bit. If I were to face crossbows or cavalry, I'd put on a padded jack under the BP, otherwise no. Waist constriction doesn't make in uncomfortable, but it takes some time to get used to it. Now that would look impressive in a breastplate. Wew. Nice waist However, I hight recommend checking the doublet length and hose construction. The codpiece for instance is way too large, the space betwen codpiece and upper hose ending also. What are you aiming for, french, german, italien fashion? I agree with Jens on this. I have to say I'm not convinced by this doublet design. It has the feel of a garment cut incorrectly and then trussed to the wearer to get an approximately correct shape. The trussing at the waist (nice to see a waistline in the correct place BTW ) is distorting the shape of the doublet quite badly; definitely the skirts, and possibly affecting the fit at the neck and arms. Distortion has much to do with making the torso from 4 panels instead of 8. The rather large change in circumference would need strongly curved separate skirt panels, but as it's not cut that way (I didn't know better when I started), the material develops rather big wrinkles there which indeed make it not so great-looking. Some more distortion result from cross-lacing pulling it up-and-in instead of only in, so I made a fresh photo with ladder lacing. Now if I only knew why I lean slightly to the right when I think I'm standing straight... Even more distortion comes from this being the first doublet I ever started (and the second piece of garment), and experimented with several things on it. The hose is just as experimental (and as I said, still under construction) as the doublet. I wanted to find a way to make it close fitting, fully joined, self-supporting AND highly mobile. Next I'll pad the central area which hopefully will result in a better looking codpiece, with wrinkles between it and the thighs - it's probably (most likely) not historical, but even with cutting it on the bias and boiling it before (I got wool for it instead of cotton), it tore repeatedly during actual use (that is, when my thighs are apart by roughly 160°-170° during a lunge targeted very low), so I had to find a way to make it satisfactory for my needs. 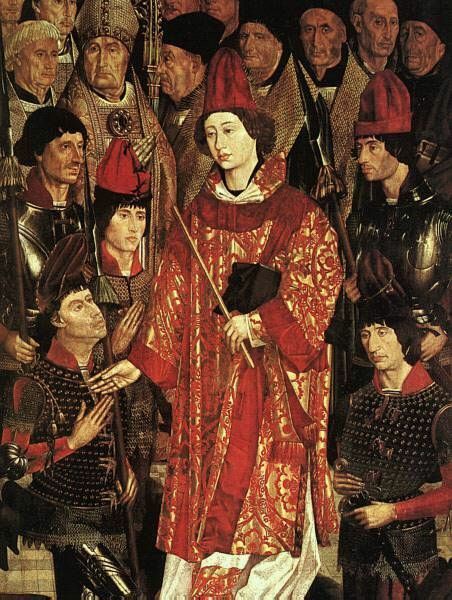 Basic inspiration for the project was several martyrdom illustrations from around 1460-1490 (mostly 1480-90 though) southern HRE - if IMAREAL's dates and locations and my ability to pay attention are to be trusted. Several of those show both shorter and longer skirts, not always in the later=shorter order. As my main goal was to depict a recognisable idea of these people, it most likely wouldn't be considered historically accurate even if I was far better with scissors and needles. Especially as I took elements from several different pieces AND added my own nonsense to it. I posted the picture here only to show that those waists can be achieved even if the wearer is overweight like me, and to add that constricted waists aren't incapacitating. I do not aim to convince anyone that this design is good or historically accurate. Also, I welcome more in-depth critique and comments, as I have very much to learn. Some images I used as inspiration along with several others. Edit: link to photo added. Mark, I believe the straps on the arms and legs are jack chains. I agree. Legs? How do you call to the jack-chains that goe there? Hose-chains? The other one at our right, doesn't seem to have such things, and the multiple dark lines on his hose may be reinforcing leather strips. Both can be seen in this image. There are several available arming garments on the market, and I hope this research will help me choose the right one. Why do civilian clothes have epaulettes (shoulder tags) on them? And I have a nice grey wool trench coat somewhat resembling the great coats of WWI, but for some odd reason I've never been in or dug a trench ....... So, in period, a " cool " civilian approximation of something militarily useful could be worn for every day use but actually be useless for it's original purpose. theres also the tendency for some people to wear that russian winter hat with those upturned panels. well we actually are. we have maces, poleaxes, lances, wwarhammers, flails, halberds . my understanding of plate armours benefits is the fact its a large, rigid plate, or a few plates, that readily allows the force of an impact to dissipate across a wider surface area. where did the impact go? did the armour just sort of vibrate away the impact energy? or would it have been passed to the man underneath? It's a little off-topic now, but the question is, what you're aming for. If you're aiming for a southern HRE-fashion in the time frame about 1485-90 there are probably some better sources then IMGReal alone, and spurces before 1480 qon't help you much, since they show completly different codpiece designs. Also I would be careful with padding it- I know of no souces before the early 16th century for that here. The general quesion will be, what hose design you're aiming for, since the late ones don't have a long "babana" shaped one ending beyond the upper border of the hose, and just bellow the waist line of the doublet, but like the italien ones bellow the upper hose border. Also you have to be very careful with images from IMGReal. Only because an image is nowadays located in austria, it doesn't need to had originally been painted there. Or, in several cases, like the schottenaltar for instance, they follow fashion from belgium because it bases on templates from there. So the fashion you see in those pictures isn't necesarrily always HRE- and apart from that, there are differences in the HRE between several regions. Fashion from vienna differs in some cases from that in some southern german regjons. What especially puzzles me are the shoulders of your doublet- they should not have that puffy apearances. Additionally, the doublet clousure at the front, just on top of the codpiece, normally shows no trace of a lacing. perhaps it is done internally, perhaps hook and eyelets, but not exterioir lacing. You can clearly see that in the images you linked. So, the waistline you achieved is really astonishing, but I highly recommend rechecking the general shape, fit and details not only of the hose, but also of the doublet.